The Roman Walls of Lugo are the only complete and intact urban defensive walls surviving anywhere in the former Roman Empire. Their circumference is 2.117 km. Five of the original gates, and 46 interval towers are still intact. Lugo was called Lucus Augusti by the Romans. This regionally important colonial town was founded in 15-13 BCE. The walls however were only constructed between 263 and 276, when the fear for invasions became too high. 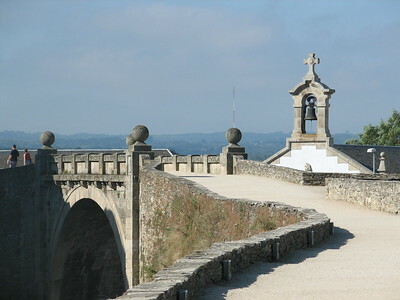 The fortifications couldn't withstand outsiders for too long: Lugo was subsequently sacked by the Suevi, the Visigoths, the Moors and the Normans from the 5th century on. The city of Lugo is located in Galicia, on the route to Santiago de Compostela. I encountered a few pilgrimage cyclists on the way, but no hikers. 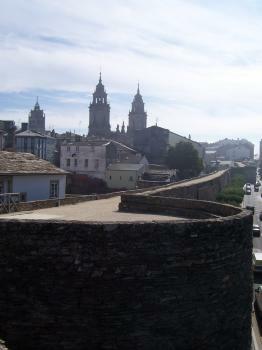 Lugo's WHS status is for having the only Roman city walls that are both intact (i.e. authentic enough) and entirely complete. In this, they beat the similar ones in Carcassonne, Avila and Le Mans (according to the ICOMOS evaluation at inscription). My goal for the day was to walk the entire circuit (2km). I accessed the ramparts from the Rua do Teatro. The most amazing thing at first sight is how broad this wall is! Four to seven meters wide apparently. It's just like a major road. The only comparison that directly came to my mind is the City Wall of Xi'an in China (it is newer, 14th century, but even wider). If I remember well, they even allow cyclists there. It's a very fine stroll. It goes up and down slightly, the heights of the wall very between 8 and 12 m. You also get a good look at the city from all sides, although it's a kind of 'railway view' (in plain sight are not the best of houses). I encountered lots of joggers on my walk, some even twice. For a good exercise one has to round the circuit several times. The entire walk took me about half an hour including photo stops. A quick site to visit! I didn't venture into the city center of Lugo, but made my way north to other Roman remains instead: the Torre de Hercules in A Coruna. I visited this WHS in June 2016. I walked the whole loop on the walls as well as round the walls from beneath. The Roman walls are really huge, 4m thick and varying between 8 to 12m high. There are 88 towers and 10 gates, 5 dating back to the Romans and the rest added in the 19th century as the population increased. Up until quite recently there were sections of the outer walls to which houses were attached but these have been removed. A visit to the Centro de Interpretación da Muralla de Lugo in Praza do Campo helps to give detailed information on the walls' importance. The only tower with two arches hints to what the towers must have been like in Roman times. Next to the Santiago Gate is a white vertical slab with the UNESCO plaque. The Camino Primitivo and the Camino de Invierno both start or pass through Lugo. I enjoyed my stay in Lugo and I'm glad I stayed for 1 night within the walls. That way I could enjoy Lugo's everyday life from different viewpoints on the walls: from school children playing at lunchtime, people jogging, sunrise, sunset and the walls lit at night. I had a lovely morning strolling along the circuit of walls watching banks of fog roll in and then burn off in the early autumn sun. Like, Els I also encountered lots of joggers, and must admit to being a touch envious that they had such a lovely route to run. The walls can at times be quite high, and it was interesting looking down on the everyday life happening around them much as it has done for the close to 2,00 years since their initial building. 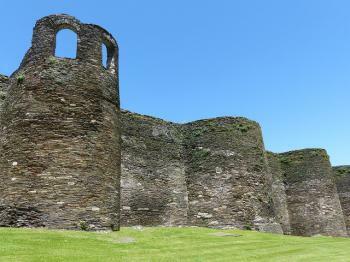 It reminded me a little of the Roman castle at Portchester where I grew up, but the walls in Lugo were much larger. I did spend a little bit of time walking around the town itself which was quite pleasant; the cathedral is evidently based on its much grander cousin in Santiago. Lugo was bi-passed by the main pilgrimage route west (Camino Frances) but features on the earlier Camino Pimativo reflecting the towns age. I had intended to stay a night in Lugo however the draw of the Camino was too strong and I headed off comfortable that I had seen all I wanted to in the 2.5 hours I was in the city. The walls are very impressive, and their age even more so, there are no towns in Europe that are encircled by a set of defences of this vintage, and as such it is well worth its place on the list and worthy of at least one circuit of its walls. 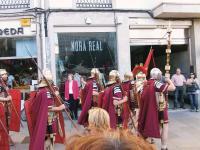 When I arrived in Lugo there were Roman legions parading around the Praza Maior and crowds of people dressed in togas were feasting and imbibing at various stalls. But I would imagine that when not in fiesta mode it is fairly ordinary. But the town's walls are extraordinary for their thickness, elaborate archways and the continuous walkway around the top. Roman Walls in lugo are awesome. It is a fascinating place: Good food, nice people, unique features, and amazing celebrations like San Froilán. The Roman Walls themselves are enormous and well preserved, you can walk around the city on top of the wall (2,5km). Actually they walls are so huge that they would fit a dual carriageway. If the walls wouldn't be there there aren't many reasons to visit Lugo.